Samsung this week announced its first LPDDR4 memory chips made using its 10nm-class DRAM fabrication technology. The new DRAM ICs feature the industry’s highest density of 16 Gb, are rated to run at 4266 MT/s data rate, and open the door to more mobile devices with 8 GB of DRAM. Earlier this year Samsung started to produce DDR4 memory using its 10nm-class DRAM manufacturing process (which is believed to be 18 nm) and recently the firm began to use it to make LPDDR4 memory devices, just as it planned. The thinner fabrication technology allowed Samsung to increase capacity of a single LPDDR4 DRAM IC to 16 Gb (up from 12 Gb at 20nm introduced in August, 2015) while retaining a 4266 MT/s transfer rate. 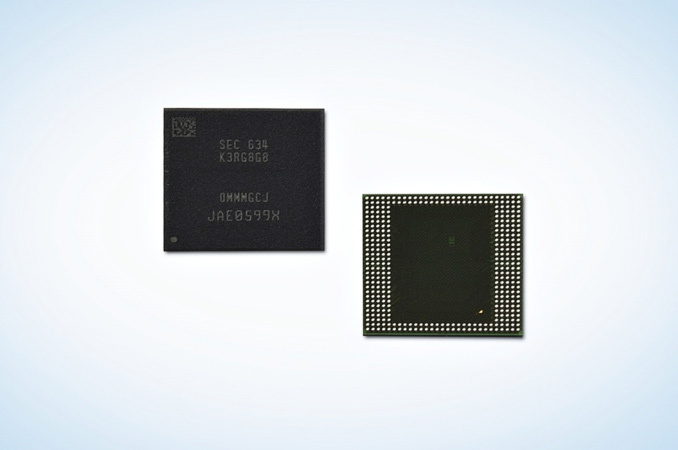 The first product to use the 16 Gb ICs is Samsung’s 8 GB LPDDR4-4266 mobile DRAM package for smartphones, tablets, and other applications that can use LPDDR4. The device stacks four memory ICs and provides up to 34 GB/s of bandwidth when connected to an SoC using a 64-bit memory bus. The 8 GB DRAM package comes in a standard 15 mm x 15 mm x 1 mm form-factor, which is compatible with typical mobile devices, but Samsung can also make the package thinner than 1 mm to enable PoP stacking with a mobile application processor or a UFS NAND storage device. Samsung has not revealed a lot about the cost efficiency or power consumption of the 16 Gb LPDDR4 ICs, nor have they discussed those details for the 8 GB LPDDR4 package either. What little Samsung has said is that the latter consumes approximately the same amount of power as a 4 GB LPDDR4-3200 device (four 8 Gb ICs) made using its 20 nm-class process technology. Taken at face value, one can extrapolate that the switch to the 10nm-class fabrication process allowed Samsung to double the capacity and increase performance by 33% at the same power. Unfortunately, we do not know anything about the geometry scaling of the new ICs relative to Samsung's older ICs, so it's hard to even guess how much Samsung's newest DDR4 costs to fab. Samsung has not officially commented on when it plans to start commercial shipments of its 8 GB LPDDR4 packages, but it is reasonable to assume that the company will commence sales of such devices in the coming months, with actual products hitting the market in 2017. Hmmm, it may actually be twice as fast. My first thought was it was 128bit, but it says 64. Keep in mind for a desktop system ram bandwidth is ample - it doesn't really make a difference, for example quad channel shows abysmal to no gains in pretty much every software out there, prosumer stuff included. What's this talk of "regular" DDR4? Are you referring to DIMMs? That's just a form factor, they use the same die, just in different packages (x4 or x8), on a separate circuit board with a connector. Also, they do sell DDR4-4266 (2133MHz clock, you're right about that) in DIMMs, so it's not any faster than desktop RAM, it's the same. Which makes sense, since it's the same die, just packaged differently. I don't believe any CPU memory controller exists to run DDR4 at that rate however (without overclocking), which is probably what you're referring to. No mobile controller can run at 4266 yet either, but they will get there...and so will the desktop CPUs.